Do you have an Instagram Branding Strategy? Now that you know the basics of Instagram (if you don’t, click here) it’s time to tell your story and showcase your work. You could start randomly uploading pictures here and there and writing some captions, but if you want Instagram to benefit your business, this is not the way to do it. This post includes affiliate links. If a purchase is made through such links, I will get awarded a small commission, at no extra cost to you. I only promote products that I truly believe in and that I have used myself. As you can see, I have a nice color scheme/brand that matches my blog. Your Instagram account should reflect your website/blog. So here are the steps to branding your Instagram Grid. Step 1. How often will you post to Instagram per month? You might be asking, “What? Why do I need to do that?” Instagram is a great tool to connect with others and build your business. Your grid should be inviting and NOT sales oriented or come across as spam. Your grid should come across as a helpful tool to your audience. I recommend that you choose anywhere between 8 to 12 categories. For example, these are my photo categories: books, inspirational/motivational quotes, skincare, branding tips, coffee, inspirational photography, SAHM lifestyle (highlighting my kids and hubby), WAHM lifestyle, food and opt-ins. As you can see, all of these categories reflect my blog and my mission to helping women build their businesses on social media. Take a look at my grid above; you’ll see some categories reflected throughout the photos. Oh yes! This is important. Each month, typically the first day of the month, I sit down with a printed blank month calendar (just google calendars and print one) and begin to fill in each day with my photo categories. I spread them out evenly throughout the month. So typically each category is scheduled 2-3 times per month. Think of Instagram as a story board. You’re taking your audience on a journey, photo by photo, giving them valuable content and they continue to come back for more! This is where subject matter, filters and color scheme come into play. If you’re not sure how to start, think about your overall mission. Use this as your criteria for your images. For example, my profile bio says this: Helping mompreneurs grow social platforms and brand themselves * Blogger w/ Instagram + #socialmedia tips * Coffee-obsessed * Global Skincare CEO. Again, take a look at my grid and my photos certainly reflect my mission. Personally, I need to see my photos together before I post to Instagram. I use two apps to plan my layout: VSCO and The Preview App. Both apps are great to pop in your photos because it looks just like your Instagram Grid. I use these apps every week. To sum it up: categorize your photos, use the same filters, ensure that your colors work well in your grid and stick to your mission. Follow these rules and you’re golden. Watch your Instagram game explode! Check out my Instagram feed from over a year ago: YUCK! What a mess! It was a HOT MESS! No branding, no categories, and no color scheme. 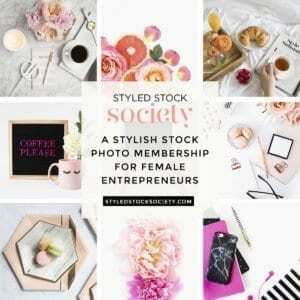 If you need help with stylish photos, jump on over to Styled Stock Photography. Do you need a little refresher on your IG account? If so, click here! Love this. I haven’t been planning my grid but I will post a photo first and if I don’t feel it looks right with the rest of my grid I don’t post it. Still working on it! These tips will help! Love this! Definitely going to use the planning grid! Thanks for sharing before I started blogging, I always thought Instagram was for rich teens showing off,did`nt know I could use it to promote my website. You definitely gave me some food for thought! I haven’t been planning that far ahead. I love planning out my Instagram feed in advance. It’s been so helpful for me. Instagram is one of the things I haven’t mastered yet, so your post is chock-full of great information for me! Thanks for posting! I have been looking for ways to improve my Instagram page and gain followers. Will follow these tips. Thank you. This is a great post! I need to start working on my grid! These are awesome strategies to help with social media marketing! Thanks for visiting my website. I love helping mompreneurs brand and design their passion on social media, especially Instagram. I have so much to share with you! I came across Allison's site and loved the content. I reached out to her for some friendly advice on my Instagram account. I was new to Instagram and had been stuck at about 200 followers for a few weeks despite actively posting everyday and engaging on other accounts. She made a quick video and offered some really helpful advice on making changes to my feed and getting my fundamentals right in terms of headline, bio, hashtag usage and feed cohesion. I Implemented those strategies and saw my engagement bump quickly from about 30 likes on a post to 100-150 likes. Thank you so much Allison. You have been immensely helpful. My site includes affiliate links. If a purchase is made through such links, I will get awarded a small commission, at no extra cost to you. I only promote products that I truly believe in and that I’ve used myself. ATTENTION COFFEE LOVERS: GET 10% OFF! Learn how to create a logo for free! In under 20 minutes! We may be mompreneurs rocking our sweatpants all day, but we can certainly look amazing doing our job! Are you looking for a home-based business opportunity? Be your own boss! Earn extra income! Contact me.